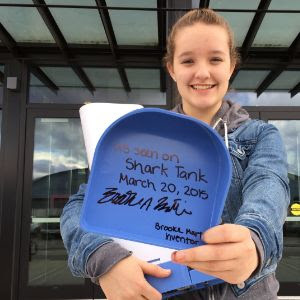 You may have seen this young lady on the TV show Shark Tank. This is her Kickstarter video. I am posting it here because the clip shows us several great uses for technology and gives us an opportunity to evaluate how technology is used in our families. Technology is used as a tool. This is technology at its best when it is serving a purpose other than entertainment. Too much screen time can lead to problems such as obesity. When we remember that technology is a tool to help us learn, or solve, or design, then it is easier to keep screen time in check. Technology is used to improve empathy. One of the downsides to spending hours playing violent games is that empathy development takes a hit. Children who play violent games can be less likely to care about other people. This may not be a problem for every child, however, each hour spent with a game is one hour not spent with a friend, sibling or parent. Technology is used for problem solving. In a school system that values high stakes testing children do not do as much problem solving. They tend to do more problem answering and that is just not the same. Technology can be used to help a child find a problem to be solved, research possible solutions, and arrive at answers. Spend some time talking with your spouse and children about technology use in your home. Keep track of how often the computer, tablet, or phone is used as a tool and how often it is used as entertainment. What tips and/or solutions work for your family?